This place has so much history! It is all just way too much to take in. Every where we go has its own story about how it was formed and what has happened there in the past. I guess a product of this is the huge amount of dead people... There seems to be graves every where we go! Another observation (continuing the theme from the last blog) is how crazy the roads are here. Because a lot of these places have developed over hundreds and hundreds of years, they weren't really designed for a lot of traffic. Most streets inside the small town are wide enough to fit a horse and cart down. You run into trouble when you have a row of parked cars and two rows of traffic. There have been some very close calls. It doesn't help that the Irish are maniacs behind the wheel! It is crazy how much this place reminds me of New Zealand. Lots of green grass and hills, sheep and cows on the side of the road. Even the roads themselves remind me of home. Our final observation also continues from our previous blog - this place is expensive! We have found that when you look at the price of things here - generally it is the same as back home. Only difference is it is in euros! Meaning it costs us double. We have seriously cut back on some luxuries... like eating! Nah, its not quite that bad yet, but we are quickly learning what we need to buy and what we don't. Day 38 - We traveled out of Dublin to Glendalough. It is a historic site founded in the 6th century by St Kevin. We saw the 'Gateway' - the entrance to the settlement, The Round Tower - a huge 30m tall bell tower, the old cathedral, the preists house and the graveyard. It was amazing to think how long ago this settlement was built and how people used to live. We then traveled to a town called Thomastown. We had some awesome Ireland weather along the way. There is also a pic showing how tiny these roads are and what nutters the Irish are! Thomastown was this small brightly colored village which contained Jerpoint Abbey, founded in the 12th century. It is a huge tower that has lots of ancient carvings in the walls and on some of the graves. From there we travelled up to Kilkenny, main attraction being the Kilkenny Castle. The castle itself was massive and the grounds were huge! We had a bit of a look around the town (read: got lost) then headed off to our final destination for the day - Cashel. Cashel is home to the 'Rock of Cashel' - a huge castle perched on a hill overlooking the town. It was an awesome sight, but we didn't go up and look around as it was getting late and we needed to find somewhere to stay. After going to a couple of B&B's and Hotels, ranging in price from 80 euro to 150 we decided to go to the information center to find out where the 'cheap' accommodation was. They directed us to a 'lodge' just out of town. It was very nice and had an awesome view of 'the rock', as well as some old ruins across the field. The owners seemed really nice and even offered to put on a load of washing for us! It cost us 65 euro / 130 aussi dollars. Now I dont mind paying $130 for a nice place, but our whole focus at the moment is longevity. There is no way we can afford to travel for as long as we want to paying $130/night. From that point on we decided we needed to plan a little better so we could find decent but cheap places to stay for the rest of our trip. Day 39 - We got up fairly early so we could get on the road. I dropped our key back and went to pick up our washing, and the guy asks "have you paid for that". I said no, I wasn't told there was a charge, the woman just said to bring it in and she could do it no problem... I asked him how much, and he replied 10 euro... 10 EURO! Are you kidding? That load of washing cost us 20 aussi dollars. Could have almost bought new clothes for that much. Anyway, we headed up for a closer look at the Rock of Cashel. It is even more impressive when you see it up close. We decided not to go in as it was 6 euro each to get in and after the mornings washing episode we were feeling a bit tight. We could see most of it from the outside anyway! We took a walk around the castle and took lots of pics. You could see over the whole town from the top - see pics. From Cashel we headed to Blarney and the famous Blarney Castle. There is a special stone right at the top of the castle which when you kiss is meant to give you 'the gift of the gab'. The castle itself is amazing. You get to go up inside it - up the original spiral staircases, they are tiny and made completely out of rock. They let you in to all the rooms in the castle - the old bedrooms, the kitchen and the banquet hall. Alot of it has been damaged over the years but it is still amazing to see how people lived. There are also tunnels that go under the castle to the well and the dungeon, which you can still go into. Anyway, we made our way to the top where the stone was. To kiss it you have to lye on your back and lean down backwards. There is a guy holding you but it is pretty intense when there is a 30m drop below you. Rochelle didn't quite work up the courage to kiss it. Cobh was our next destination. This was the last port of call for the Titanic before it sunk, and also the port the Lusitania departed from was headed for when it was sunk. The town has a beautiful port and is full of brightly colored buildings. It also has the St Colmans Cathedrial - this has to be the largest building we have seen yet. It is massive! It towers over the small village. The bell tower contains 49 bells or something crazy! We think it has to be bigger than the church we saw in Montreal. We got to go inside for a look, which was really cool. The detail in these churches is just unbelievable. While this one was not quite as the impressive as the one in Montreal, it was still really amazing. From Cobh we headed to Cork, where we spent the night. We managed to book ahead and got a place for 40 euro... not too bad I guess. 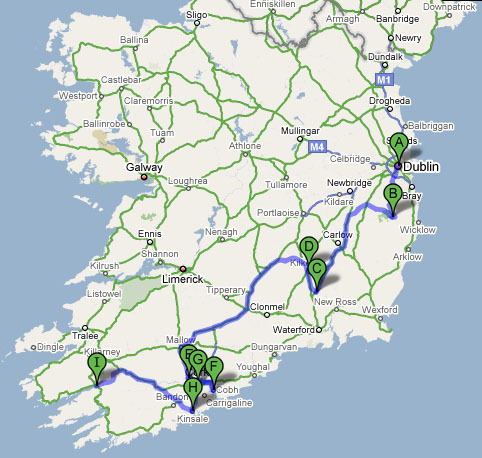 Day 40 - We set out to see the sights of Cork. We had planned to get on a tour bus that takes you around all the interesting places... but apparently it is not running at the moment... awesome. So we decided to walk it! We walked down the river Lee to St Fin Barres Cathedral. We then walked through the university to the Cork Museum... unfortunately it was closed. We then walked up the hill to the old Cork Jail. We took an audio tour (with some snazzy tape players!) which was really interesting. After that we strolled through the center city for a bit, had some lunch, then headed back to the car. Our next stop was Kinsale - a small coastal village. The town was what we had come to expect - lots of brightly colored houses placed very close together on steel hills with thin streets. Still very cute! Here we went to see 'Charles Fort' - an ENORMOUS star shaped fort built in the late 17th century. This place was so cool! I want a fort! We wandered right around the outside taking in the views of the bay, and enjoying the miniscual amount of sunshine we were receiving. Our final stop for the day was Kenmare. We havn't yet had a chance to explore yet as we got here after dark. The main attraction here is it is going to be our start point for our trip around the 'Ring of Kerry' - I have been told the best scenery in Ireland.